Alvin Lee has a piece of life advice. "Plant as many good seeds as you can. They will grow and come back to save you one day," he says sagely. Cultivate good relationships. Have an open heart and mind, and do not give up on yourself or your dreams, he adds. Platitudes, some will say. But these beliefs have helped him navigate the peaks and troughs of his life. In his 30s, he gave up a cushy corporate job, ignored naysayers and headed to the United States to market a sandcastle building kit he had designed with his son, nephews and nieces. In his 40s, he got involved in a start-up and lost his life savings when the dotcom bubble burst. "More than 20 years ago, I planted a seed when I came up with the sandcastle building kit. Today it has come back to save me," he says. 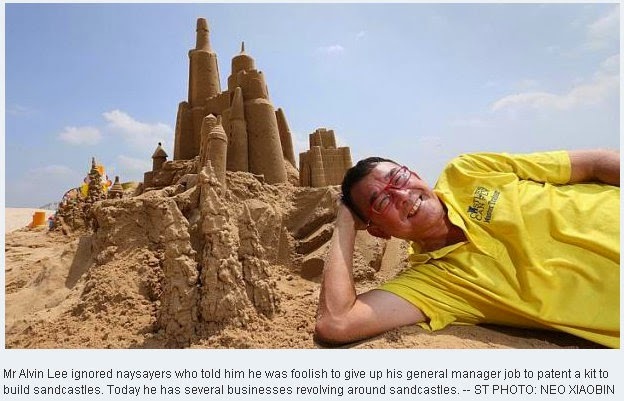 Now 57, Mr Lee is the founder of Castles Can Fly, an outfit which earns a handsome profit from sandcastle building activities. Besides using sandcastles to conduct training and team-building sessions, it also organises events and parties for corporations, organisations and others. Its social enterprise arm encourages creativity and helps families and the underprivileged interact and bond. With skin tanned honey brown from hours under the sun, the industrial engineering graduate has an easy manner and a gravelly voice. His father sold ang ku kueh - steamed glutinous rice flour cakes with a mung bean filling - and had two wives who were sisters. "The first wife bore him four sons, and the second wife three. My mother was the second wife, and I'm her eldest son," says Mr Lee. The whole brood lived under the same roof in a brick house in a village in Somapah, where the Singapore Expo now stands in Upper Changi. Making ang ku kueh was a cottage industry for the family. The village and the market had their share of unsavoury characters, from gamblers to drug addicts, but he and his brothers knew from a young age not to keep their company. He attended Changkat Changi Primary, St Patrick's and Tanjong Katong Technical and became the only one in the family to enter a polytechnic. In his final year, he aced all his subjects. "That was when I realised that I had a shot at university and could actually go somewhere in life. But we were too poor." National service came next, and he was selected for officer training. He decided to sign on with the army after completing the course. "I was 18 years old and I remember drawing a line down the middle of a piece of paper and listing the pros and cons. The salary was not bad, I would have a rank, I could eat in the officers' mess, and I could be a yaya papaya and walk around and people would go 'Yes, Sir', 'No, Sir'," he says with a laugh, lapsing into Singlish. Almost immediately, he was sent to Sweden for training so that he could help set up the Singapore Air Defence Artillery. "I remember the whole village came out to send me off at Paya Lebar Airport in 1978. My father told everyone I cho gua," he says, using the Teochew expression for government official. The trip stretched his mind. Mr Lee spent five years in the army. Each year, he would apply to a different university abroad, including the University of Strathclyde in Glasgow, Scotland. "And every year I would get a place. My dad would hand me the envelope and ask, 'Why are you applying? You know we have no money right?'" recalls Mr Lee, adding that government scholarships in those days mostly went to A-level holders, not polytechnic graduates. "I guess I did it just to prove that I could." He had no firm career plan when he decided to leave the army. "I just knew I didn't want to be a career officer," he says. Two brief sales stints followed, one for a Swedish maritime company and another for a company selling water scooters. It was not until he was working at C Melchers - a global conglomerate offering a whole range of services - that he did well enough to save some money for his longed-for university degree. Although he was supposed to sell meters, he ended up selling a $400,000 system to test bullets to Chartered Industries. By then married to a secretary, he quit after two years and headed off for the University of Newcastle in New South Wales, Australia, with $15,000 in his pocket. To make ends meet while he studied industrial engineering full- time, he waited tables, drove taxis and did other odd jobs. He was the president of the Singapore Students' Association too. "My son was born in my second year. That year I failed three subjects," he says with a laugh. But he graduated. He became a production engineer at Seagate, earning just $1,800 - almost half what he made at C Melchers. Two years later, he and his wife parted ways amicably. His next stop was Thomson Electronics where he applied for a company scholarship to study part- time for his MBA from the University of Brunel Henley at the Singapore Institute of Management. His energy and resourcefulness inspired one of his Indonesian clients to hire him to run his electronics factory in Jakarta. The job paid handsomely, and Mr Lee flew back every weekend to be with his son. "One of my brothers lived in the flat above mine, and every weekend, I would do things with my son and my nephews and niece, like painting murals and making kites." They also spent a lot of time at the East Coast Park beach and that was when the idea of a sandcastle building kit took root. With input from the children, he would fashion the tools for the kit in the kitchen of his four-room Tampines flat. Putting his MBA training to good use, he came up with a business plan, again with input from the children. He sent it to at least 25 toymakers here but came up against a wall. "Nobody believed in me except the children. I could not give up because if I did, the children would also give up when they grew up," says Mr Lee, who forked out a few thousand dollars to have his sandcastle kit patented. He decided to train his sights on the US which had a developed toy market. So he quit his job to pursue his dream. "I went to my boss and told him. He didn't tell me whether I should stay or leave but he gave me the best piece of advice ever. He told me to think about what I saw myself doing and what would make me excited every morning five years down the road," he says. After receiving a positive response from a plastic manufacturer, he flew to a toy and craft fair in Chicago to meet the management. Alas, the company had pulled out of the fair at the last minute without informing him. But armed with his business proposal and business card, he approached several of the exhibitors. One of them, plastic products firm Eagles Affiliates, came on board and signed a contract to manufacture the kit named Beachworks six weeks later. Besides what he asked for, the company allocated US$1.5 million to help develop the toy and even engaged him to oversee its production. Released a year later in 1997, Beachworks proved a hit and was featured on several programmes on different news networks. Mr Lee went back to a full-time job after the kit's successful launch, working in Colorado for a high- tech electronics firm and, later, in Beijing as a production director for branding and event organiser Pico Art. A start-up, 3Fusion, which had more than $14 million in funding, then headhunted him to become the CEO of its online shopping subsidiary in 2000. Within 18 months, it crashed. "I was 45 years old, and all the money I had made had gone into it. I stood as guarantor for many things and was sued almost bankrupt," says Mr Lee, who lost his life savings of nearly half a million dollars. A year of darkness followed. "No one would employ me," he recalls. "I finally found work managing a food delivery company but was told to leave after a few months, not because I did not work hard but because I was deemed too qualified for the job." Life, however, was not entirely bleak. He married Ms Joy Leong, his office manager at the start-up. "I asked her why she agreed to marry me. She said, 'In Shenton Way, there is a saying: Buy low, sell high. I've seen when you were high so I will buy you now since you're low. One day I will sell you'," he says of his second wife, with whom he has two daughters, aged eight and 11. His son is now 29 and works as a lab technician. A friend then suggested he become a corporate trainer. Although he baulked initially, he soon warmed to the idea and went about assiduously developing content for a talk on innovation based on his experiences. Around the same time, a friend of a friend who had heard of his plight lent him $10,000 with no questions asked. Mr Lee wrote his book, Castles Can Fly, now in its third reprint. He got his first break when he was engaged to speak at a school principals' conference. Word spread, and soon he was giving talks at schools and organisations. In 2004, he decided to take his business outdoors; sandcastle building became an important training and motivational tool. The following year, he started a social enterprise arm, Castle Beach. Every weekend, with a band of volunteers, he promotes building sandcastles as a healthy bonding exercise free of charge at East Coast Park. "My corporate and social enterprise arms feed each other. The more activities I do for Castle Beach, the more corporate business I get. And the more corporate business I have, the more I can continue my social enterprise," says the entrepreneur whose clients include banks, insurance companies and government corporations. He has also licensed his training methods to companies in Malaysia, Hong Kong, Brunei and Mauritius. Life, he says, has come full circle for him. "First, you build castles in the air. Then you build castles everywhere." "One year, after everything was done, I asked Howard why he chose me. He said: 'I saw a hungry person. You basically put the whole file into my hands; I didn't have to do a single thing. You told me a lot about sandcastles but you also told me a lot about what you didn't know. You were also an honest man'." "A lot of my engineer friends said I was mad to leave my general manager job. They said: 'You have an MBA and an engineering degree. Why are you wasting your time making a toy?' I said: 'Do you know how much of my engineering degree and my MBA went into this?' Everything is a waste of time if you think negatively. It's not what you have; it's what you do with what you have that's important." Kids' stress: Whose fault is it?